K-73x Free change the color as you like.Custom bobblehead dolls made to look like you! This custom newlyweds bobbles will be a good option to make your gift unique. 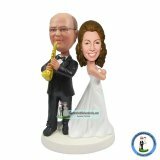 By making the groom and bride's face bobbling on the black tie wedding bodies, it will hit the ceremony with big fun.Custom bobblehead of a couple hand in hand with their favorite cat & dog stand front waiting for photographer to say cheese.How happy it is!They don't need to talk a lot, but know each other clearly by just a easy smile or a slight sign. 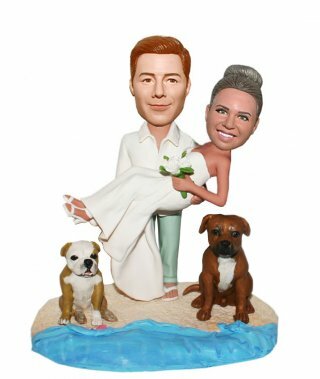 If you happen to have this type of friends and they happen to get married, this custom bobbleheads are pefect to be a wedding cake topper for them.